Your customers become “VIP" members by connecting to Wi-Fi and registering once, typically via Facebook or a short form (email). No App is required. 30-60% of customers also respond to a simple customised survey following to collect preferences and phone. Then, customers will be auto-connected. No manual check-in at any location of your brand. Profiles include data from social networks, preferences, reviews, visits, PoS, CRM, and predicted traits. Now, imagine a world where you can see information about customers as they walk through the door. Well, Cheerfy already provides employees with real-time notifications about VIP customers via tablet, smartphones, smartwatches, and even bluetooth headsets! Set automatic messages (SMS, or Email) on arrival to trigger personalised surprise gifts on specific visits, or events such as birthdays. The reward is redeemed via Cheerfy vouchers with the tap of a button or via QR code (with or without PoS integration). Your customers automatically receive a personalised text on arrival (“Jen: as a healthy foodie, on your 5th visit your favorite salad will be on us. The 1st is noted!”). The text acts as a digital stamp towards a personalised reward, automatically accounted based on visits. Your local customers automatically receive a text after 30 days of their last visit, with a personalised incentive to come back. Non-locals (e.g. foreigners on holiday) receive the message after 3 days post-visit, in this case, intending to maximize short-term revenues. 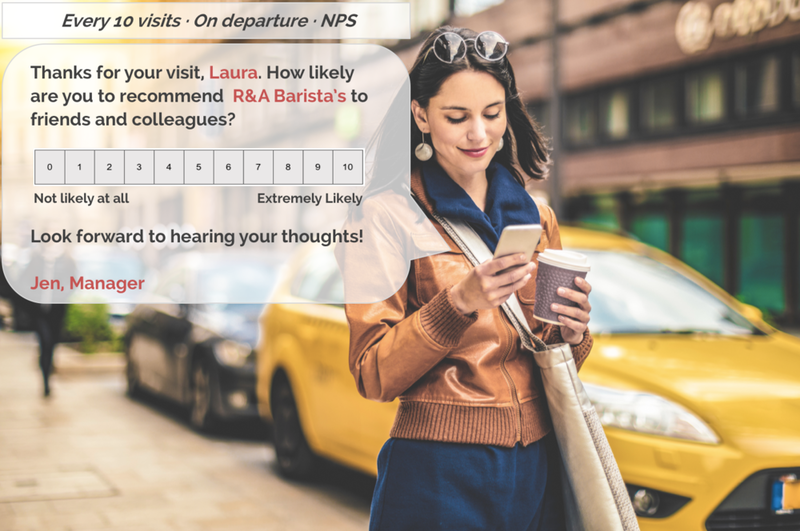 Periodically, your customers receive a message on departure to rate their experience. A digital personalised survey evaluate key aspects of the customer journey such as: greeting, environment, waiting, food, drinks, price, payment, or goodbye. 5-15% of customers respond to surveys, effectively turning diners into mystery shoppers. Your promoters are encouraged to share their views in TripAdvisor, Google or similar platforms. And personalised messages are sent to detractors, expressing empathy and/or offering a compensation. In-depth analytics on customer activity; customer profiles per location; economic impact driven by customer loyalty improvements; customer satisfaction for every part of your customer journey, and much more! Cheerfy dashboards provides you with an interactive way to find, explore, and share data-driven insights. So that you not only understand what happened — but why it happened — and what you should do next. And the sky is the limit! Promote your events to the right audience at the right time. Then, greet your attendees on arrival with personalised messages. Working on designing your new menu? Ask your customers. Incentivize them. And weigh their preferences based on loyalty. Missing a critical software integration in order Cheerfy to make a difference to your business? We would love to know about it! Already have a Wi-Fi network in place? That's perfect. Cheerfy platform integrates with the top enterprise hardware providers. Alternatively, we will send you Cheerfy Wi-Fi routers, to be directly plugged into your existing Internet connection. Setup is a matter of minutes. And the devices create a secure, quality Wi-Fi signal for your customers, and enables Cheerfy services.